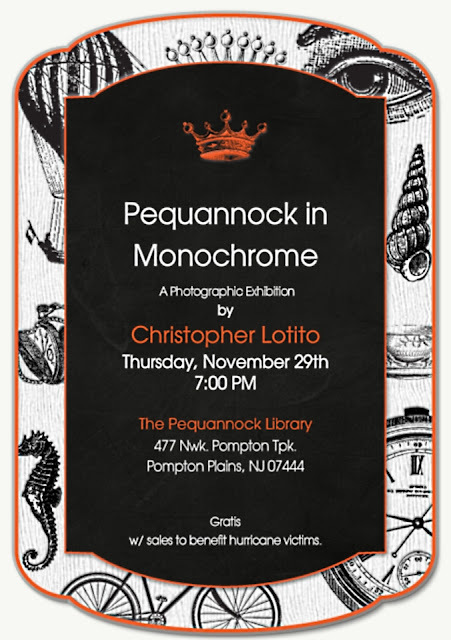 Thursday November 29th 2012, fans of history and art alike are invited to the opening of the "Pequannock in Monochrome" photography exhibit at the Pequannock Township Library at 7pm. Local resident Christopher Lotito, author of Pequannock News, will unveil his unique project to document local examples of emblematic and historic architecture in black and white, the way the images would have been captured a century ago. 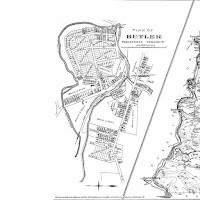 Indeed, Lotito was inspired by viewing many grainy and blurry historic images during his time on the Historic District Commission to document his hometown in a way that was both representative of the community as well as starkly beautiful. Lotito will also be selling art and copies of his photobook about local flooding, "Torrent," at the show, with a portion of proceeds to benefit local and regional victims of Hurricane Sandy.